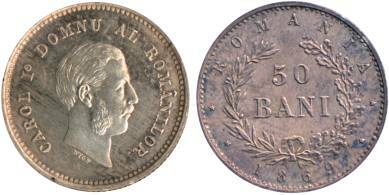 face value "50 BANI" between laurel and oak leaves, ROMANIA, year 1869 flanked by two five ray stars on each side outer pearl circle, inscription "CAROL I° DOMNU AL ROMÂNILOR." meaning "CAROL THE 1st PRINCE OF THE ROMANIANS", the head of the prince facing right (with side whiskers). Under the neck lies WYON, the engraver's name. Romanian numismatics knows lots of monetary patterns, many of them being presented inside monograph Monede şi bancnote româneşti by George Buzdugan, Octavian Luchian and Constantin Oprescu (1977). 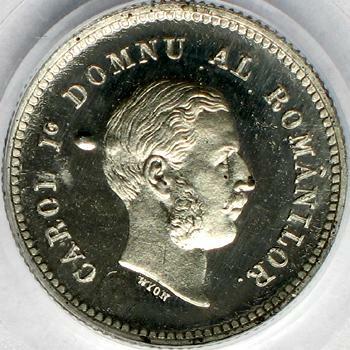 This piece that could have been the first silver modern Romanian coin appears at position 195. The pattern is struck at the Heaton Mint in Birmingham (and not at Royal Mint in London, as claimed by MBR) and portrays the effigy of young reigning prince Carol I with whiskers and side whiskers, just like on the famous 20 lei of 1868 and on four anniversary coins of the 1906 series. Click here to see the golden 100 lei of 1906 with the same young countenance. On all other coins of Carol, the prince and then king appears with regular beard and whiskers. 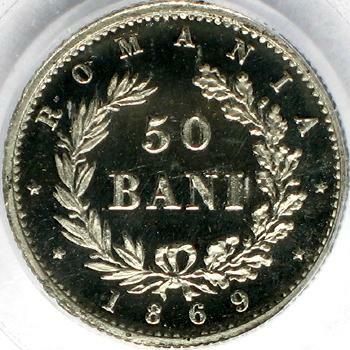 The first pattern pictures above (white metal) are present on Romanian coins through the kind permission of an anonymous donor.